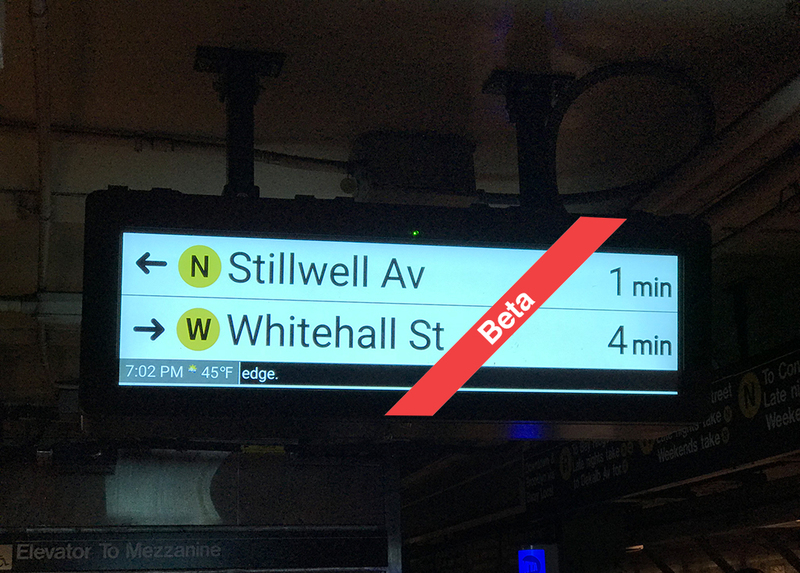 The intersection of my love for the subway, software development, and New York politics. 17 Dec 2017 The launch of countdown clocks is a lesson in failing to set expectations. With the rollout of countdown clocks on the lettered subway lines nearly complete, riders are beginning to notice a peculiarity: they aren’t always accurate. @NYCTSubway @vinbarone a G train just came two minutes earlier than the countdown clock said it would. How is that possible??? While intended as a passenger convenience, these countdown clocks have had the unintended consequence of alerting the public to just how little information the MTA actually has about trains in operation. The signal system, designed in a era before the microprocessor, lacks the fidelity of data necessary to track the location of where a particular train is or how fast it’s moving or even if it’s moving at all. All information you would need to accurately project when a train is expected to arrive at the next station. Installing modern signals would not only provide this data, but more importantly, enable the MTA to run more trains on the track during rush hours and improve reliability while doing so. Modernization on two lines, the L and 7, has already been completed1. In many ways these two were the easiest and upgrading the rest of the system will be made far more complicated by the amount of interconnection between lines. The MTA’s current strategy for implementation calls for completing this work in phases, prioritized by the segments at highest capacity. However, this poses a challenge: how do you provide arrival times for trains that are traveling in and out of track territories with a modernized signal system? When the Queens Blvd modernization is completed in 2021, will the rider waiting at Rockefeller Center find it acceptable that there are arrival times for Brooklyn-bound M trains whereas Queens-bound will not? Partial coverage would provide limited utility to riders and probably frustrate them more than clocks that are occasionally adrift. So unless we were willing to wait the 50 years it is projected to fully upgrade our signals, we needed some sort of stopgap technology – even if it’s imperfect. Utilizing commodity Bluetooth hardware and WiFi already in the stations, the MTA delivered the countdown clocks in a little over a year. It is an aggressive rollout for an organization that struggles to deliver anything on-time. There are undoubtedly improvements that can be made to the placement of clocks in stations, but I think the MTA is due some credit for thinking outside of the box to provide this amenity to customers as soon as possible. They weren't really willing to experiment though. They were forced by Cuomo to implement a jury-rigged system that doesn't work particularly well, and they spent a decent amount of money on it. I’ve seen a couple of takes, like this one from Second Ave. Sagas, that use the inaccuracies as an indictment of the countdown system’s design. It’s far too early to draw that conclusion and I believe there are other plausible explanations for why this is happening. I plan to address this in a future post and I’m cautiously optimistic there are ways to fix these problems in software. I do hope the MTA has learned a lesson from the hubris they displayed in rolling out this system though. Writing software is hard and it takes time to get right. We have grown accustom to using services that are still in beta and I think it would have been perfectly acceptable for the countdown clocks to have been labeled as such. Acknowledging they knew the system wasn’t perfect would have demonstrated a bit of humility that may have made all the difference in how these problems were received.